A 1984 sci-fi film directed by Charles Band, starring Tim Thomerson and Helen Hunt. Jack Deth (Thomerson) is a cop from 300 years in the future who is sent back to 1985 to protect the ancestors of his leaders from a psychic killer. Released in Australia and possibly some other areas as "Future Cop". Followed by five direct-to-video sequels released by Band's Full Moon Features. 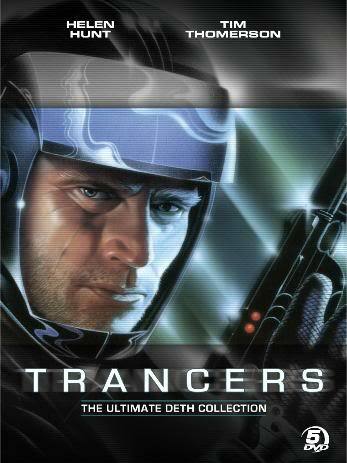 Antagonist Title: "Trancers" are mind-controlled humans turned into zombie-like killers. Awesome Mc Coolname: Jack Deth. Big Bad: Martin Whistler is the one trying to make a Bad Future in the first film. Fish out of Temporal Water: The first film has some interesting nods. Future Food Is Artificial: Implied. Jack Deth: I'm from another time, another world. I don't even know what you people eat for lunch. Gender Bender: McNulty in the first two movies inhabits the body of a young girl. Also, Jack in #6 inhabiting his daughter Josephine's body. Identical Grandson: Jack and Phil. It's a Small World After All: Jack hops into his ancestor who had just met and slept with a girl who he promised to take to work in the morning, and at her work it turns out the Mall Santa she worked with was a trancer! What are the odds!? Mind-Control Conspiracy: Whistler has been in the past long enough and his ancestor was in a high enough position in the police department that the police could not be trusted. Mind-Control Eyes: Not eyes but skin, in this case. Names to Run Away from Really Fast: Taken the wrong way by the man Jack Deth is trying to save. "Your name is 'Death'? Forget it, I'm not going up there!" Perma-Stubble: Jack Deth. Interestingly, the reason for that was shown in-universe. Jack's ancestor had his face lathered up and was about to shave when Jack jumped into his body. Since Jack didn't know anything about twentieth-century shaving methods, he just wiped the foam off his face and went unshaven for the rest of the movie. Plucky Comic Relief: The homeless ancestor they pick up. Reality Ensues: Build a receptacle into the handle of a gun to hold two uncushioned glass vials of the drug needed to return to the future, and firing the gun or tossing it around is probably going to break one of them. Secondary Character Title: The protagonist is Jack Deth. The antagonist is Martin Whistler. The Trancers are Whistler's mind slaves. She Is All Grown Up: The little girl that McNulty jumped into in the first movie returns as a teenager in the second. It's the same actress too, which should give you an idea of how long it took to make the sequel. The Sociopath: Martin Whistler, a criminal who tried to take over the world with mind controlled zombies, and when he's thwarted decides to prevent the people who saved the world from destruction in the backstory from ever existing. Tagline: "His name is Deth. He hunts Trancers. Even in the 20th Century." Terminator Twosome: Jack Deth and Whistler. Time Stands Still: The time-slowing watch which stretches one second into ten. Timey-Wimey Ball: Somehow, Weisling killing the ancestors of the Council only means that they disappear 300 years into the future. They can infer from this that Whistler's in Weisling's body. Also, the hoohah with Jack's own time, where after #2 he can only physically travel through time. Underwater Ruins: Before he goes to the past, Jack does scuba-diving in the old city of "Lost" Angeles. Leena: But you don't know the way! Jack: Yeah I do - I used to swim through here. What Happened to the Mouse? : Jack took over the body of Phil in order to come to 1986. He never went back to the future. So what happened to Phil?